Waves crochet hooks have the classic, amazingly smooth and flawless aluminium body. 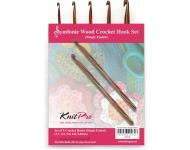 Together with colorful, vivacious and peppy soft feel grips, these hooks guarantee hours of no-stress crochet. 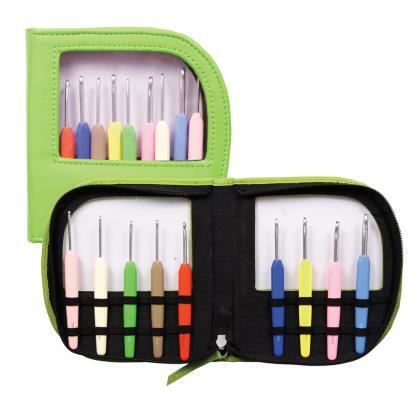 A must have for any crochet lover, and a great gift for a crafty friend. Single ended aluminium crochet hooks are used along with yarn to create intricate patterns and designs. Single ended crochet hooks are the most commonly used hooks all over the country. These hooks are easy to store and carry along, therefore make excellent travel companions. Available in a set of eight hooks in sizes 2.00mm to 6.00mm. The set is packed in an elegant leatherette bag, available in two peppy colors – pink and green. Subscribe to our Newsletter to hear about new products & receive exclusive offers!